Chandragupta I of the Gupta Empire: He was the son of Ghatotkacha and the grandson of Sri Gupta, the founder of the Gupta Empire. He succeeded Ghatotkacha and became the King of the Gupta Empire. Chandragupta, I ruled between 320- 335 CE. The Gupta empire period is said to have begun from the time Chandragupta ascended the throne. He was one of the most powerful rulers of the Gupta Empire and it was under his rule that the empire expanded and became powerful. 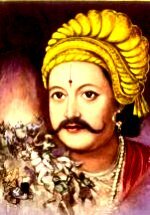 He is regarded as Maharajadhiraj, which literally means King of Kings. His marriage to Kumaradevi, the Lichchhavi princess further extended the boundaries of the Gupta Empire to the areas that were under the control of the Lichchhavi dynasty. The coins issued by Chandragupta I celebrate his marriage to the Lichchhavi princess. During the reign of Chandragupta I, the Gupta Empire comprised of areas like Prayag or the present day Allahabad, Saket or Oundh and Magadha or present-day Southern Bihar. The territories of the Gupta empire were also known as Janapadas.